Best Practice Autism: Book Review - "THE LOVING PUSH"
Young adults on the autism spectrum face significant challenges as they transition to adulthood, with many being socially isolated, unemployed, and lacking services. Unfortunately, research suggests that the vast majority of these young adults will be residing in the parental or guardian home during the period of emerging adulthood. It is clear that more needs to be done to help them thrive to the best of their abilities and attain a high quality of life. "The Loving Push” by Drs. Grandin and Moore addresses these issues with a direct, yet empathetic and positive discussion of ways in which parents and professionals can enhance the potential of "spectrum kids" of any age and help them achieve productive and meaningful adult lives. "The Loving Push" consists of Three Parts: Part I -The Path to Success Starts Here: Restoring Hope; Part –II: Stretching Your Child & Avoiding Pitfalls; and Part III: Preparing Your Child for Adulthood. Each part features Chapters containing important information, lessons, tips, and advice on how to “Lovingly Push” youth on the spectrum to reach their potential and achieve a successful transition to adulthood. The book begins by sharing 8 inspiring profiles of persons on the spectrum and using their real-life stories to illustrate the three essential components of success: “Avoiding Learned Helplessness, Learning Optimism/Resisting Habitual Negative Thinking, and The Critical Impact of Mentors.” The section on “Getting Families and Schools to Work Together” is especially important, given that transition planning is a critical part of preparing students for life after high school and producing the best outcomes. Young adults on the spectrum are particularly vulnerable during the initial years in the transition to adulthood when there is a shift in service provision after leaving high school. The authors recommend that teachers, parents, and professionals “lovingly” guide, push, and mentor our children and youth as early as possible, and for as long as possible. The book also addresses the issue of co-occurring anxiety and depression. The authors discuss counseling and evidence-based psychotherapy approaches such as cognitive-behavioral therapy (CBT) and “mindfulness” techniques to reduce stress, and improve mood and psychological well-being. Group support for children, teens, and parents is referenced, as well as important commentary on “Psychotherapy Approaches Not Recommended.” Tips and cautions about medication use for anxiety and depression are also discussed. “The Loving Push” devotes considerable attention to the problem of compulsive electronic gaming and how it can turn kids on the spectrum into “media recluses” and social isolates. Since children and youth on the spectrum tend to engage in restricted and repetitive behaviors, they are at higher risk for developing addictive game play patterns. Preoccupation with video games and trouble disengaging from them limits the opportunity for learning critical social and problem-solving skills. This Chapter warns parents and educators about the dangers of video games and screen-based media and lists steps they can take to minimize the negative effects of compulsive gaming. Far too often, parents and teachers of kids on the autism spectrum focus more attention on teaching academic and behavior management skills than on daily living skills. Parents are often surprised to learn that daily living skills are more important than autism symptoms, language or IQ when it comes to employment and life satisfaction. Part III (Preparing Your Child for Adulthood) discusses the building blocks for independent living such as household skills (i.e., cooking, cleaning), driving or using public transportation, educational/vocational preparation, and social/community connection. Explicit teaching of these life skills prior to the transition to adulthood is crucial if we expect kids on the spectrum to have the necessary skills to live independently and negotiate adult life. 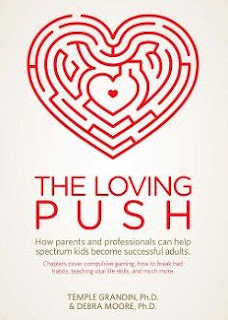 "The Loving Push” is a valuable resource and must read guide to preparing spectrum kids for a successful transition to self-reliance and independence in adult life. The book is not only highly recommended for parents, caregivers, and families, but also for professionals in private practice, schools, colleges/universities, and community settings who work with children, teens, and adults on the spectrum. Lee A. Wilkinson, PhD, CCBT, NCSP is author of the award-winning book, A Best Practice Guide to Assessment and Intervention for Autism and Asperger Syndrome in Schools, published by Jessica Kingsley Publishers. He is also editor of a best-selling text in the APA School Psychology Book Series, Autism Spectrum Disorder in Children and Adolescents: Evidence-Based Assessment and Intervention in Schools and author of the book, Overcoming Anxiety and Depression on the Autism Spectrum: A Self-Help Guide Using CBT. His latest book is A Best Practice Guide to Assessment and Intervention for Autism Spectrum Disorder in Schools (2nd Edition).